Everyone who has driven a motorcycle has experienced it, the MSF classes mention (but don't explain) it, and motorcyclists discuss it all the time. But what is it, really? How does it work? Why does it work? All questions I will try to deal with in this discussion. At very slow speeds we steer a motorcycle by turning the handlebar in the direction we wish to go. We can only do that at speeds of less than about 6 MPH. At any higher speed we do the exact opposite, whether we realize it or not. For example, assuming we want to turn to the right, we actually TRY to turn the handlebar left. This results in the front wheel leaning to the right and, as a result of the lean of the wheel, a turn to the right. 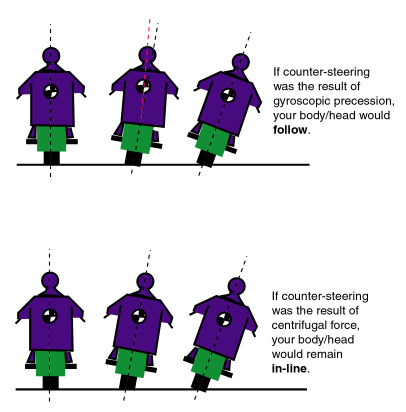 This is counter-steering. Why is it that we don't get confused regardless of our speed? Because we have learned that steering a motorcycle is an effortless chore. That attempt to turn the handlebar to the left FEELS like we are pushing the right grip rather than pulling on the left one. It feels like that because the harder we push it, the more the motorcycle turns to the right and, thus, it feels like the right grip is pushing back at you that much harder. In other words, we quickly learn to associate counter-steering feedback with the hand closest to the direction in which we wish to turn. Further, even a little bit of experience shows that counter-steering is essentially effortless while trying to turn the handlebar in the direction you want to go is impossible. Humans are relatively fast studies, after all. It takes only a modest familiarity with a gyroscope to understand counter-steering - at least to understand how most people believe it starts to work. (They are generally WRONG, but I will explain their position nonetheless.) The phenomenon is called Gyroscopic Precession. This is what happens when a lateral force is applied to the axis of a spinning gyroscope. The spinning gyroscope translates the force vector ninety degrees off the direction of spin. Thus, if we try to turn our front wheel to the left, the force we use appears as a lateral force forward against the axle on the right side and this is translated into a force that tries to lean the wheel to the right. Similarly, trying to turn the wheel to the right results in the wheel trying to lean to the left. Since your head and body are not directly coupled to a spinning wheel, they do not precess. Your body remains in-line with the bike's body. In the case of a motorcycle, your handlebar input is immediately translated by gyroscopic precession into a lean in the opposite direction. Since your front wheel is attached to the bike's frame, the body of the bike also attempts to lean. It is the lean of the BIKE that overwhelms the handlebar effort and drags the front wheel over with it - gyroscopic precession merely facilitates the process and is essentially inconsequential in the outcome. The ONLY WAY to turn a motorcycle that is moving faster than you can walk is via counter-steering it (if it only has two wheels). We have talked only about what starts that lean to take place. Indeed, all we have talked about is the directional change of the front wheel along with the simultaneous lean of the bike, both in the opposite direction signaled by handlebar input. So then what happens?